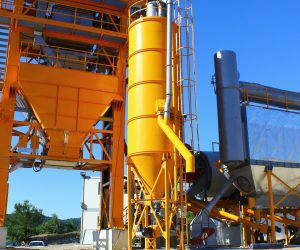 The hot recovery filler collected at the bag filter is conveyed by a screw conveyor and bucket elevator into the buffer bin above the filler scale. The excess amount of filler is transferred to the recovery filler silo through an overflow pipe. Outsourced mineral filler can be stored at a tower type silo, which comprises of a mineral filler storage section on top and a recovery filler section below. According to the customer’s choice, a separate mineral filler silo can be utilized as well. The most important advantage of SIGMA filler system is that priority is given to the usage of hot recovery filler, thus consuming heat energy.